COMMENTS:        This trigger occurred at longitude,latitude = 106.95,-6.74 [deg]. COMMENTS:        The XRT position is 2.26 arcmin from the BAT position. COMMENTS:        The UVOT position is 10.8 arcsec from the XRT position. Dec(J2000) = +78d 38' 21"
with an uncertainty of 3 arcmin (radius, 90% containment, including systematic uncertainty). The BAT light curve showed a early complex structure followed by a stronger peak at around 100 s after the trigger, for a total duration of at least 160 s. The peak count rate was ~700 counts/sec (15-350 keV), at ~100 sec after the trigger. Dec(J2000) = +78d 40' 36.5"
with an uncertainty of 5.0 arcseconds (radius, 90% containment). This location is 136 arcseconds from the BAT onboard position, within the BAT error circle. No event data are yet available to determine the column density using X-ray spectroscopy. The initial flux in the 2.5 s image was 2.67e-09 erg cm^-2 s^-1 (0.2-10 keV). with a 90%-confidence error radius of about 0.77 arc sec. This position is 11.1 arc sec. from the center of the XRT error circle. The estimated magnitude is 19.32 with a 1-sigma error of about 0.15. No correction has been made for the expected extinction corresponding to E(B-V) of 0.05. MASTER II robotic telescope (MASTER-Net: http://observ.pereplet.ru) located in Ural was pointed to the GRB160227A 30 after notice time and 115 sec after trigger time at 2016-02-27 19:34:03 UT. On our first (20s exposure) set we found 1 optical transient within SWIFT error-box (ra=12 59 08 dec=+78 38 19 r=0.050000) brighter then 17.6. The 5-sigma upper limit has been about 18.0 The message may be cited. We observed the field of GRB 160227A (Siegel et al., GCN 19098) with Zeiss-600 telescope of Mt. Terskol observatory in R-filter starting on Feb. 27 (UT) 19:45:26. We obtained several images in R-filter. We clearly detect source in coordinates (J2000) 12 59 13.7 +78 40 44.9 which is apparently the afterglow of GRB GRB 160227A (Siegel et al., GCN 19098; Gorbovskoy et al., GCN 19099). The afterglow is clearly detected in a single images of 30 s exposure with brightness of ~19.0 magnitude in R-filter at Feb. 27 (UT) 19:49:36. We observed the field of GRB 160227A (Siegel et al., GCN 19098) with HGB-500 telescope (0.5-m, f/2) of ISON-Kislovodsk observatory starting on Feb. 27 (UT) 19:38:53, i.e. ~400 s after burst trigger. We obtained several unfiltered images of 60 s exposure. We clearly detect the afterglow of GRB 160227A (Siegel et al., GCN 19098; Gorbovskoy et al., GCN 19099; Andreev et al., GCN 19100). The afterglow brightness is ~18.0 magnitude at Feb. 27 (UT) 19:38:53. The position is consistent with that of GRB 160227A (Siegel et al., GCN 19098), and the detected time is 185 sec after the BAT trigger. There was no significant excess flux in the previous transit at 18:02 UT on 2016 February 27 and in the next transit at 21:07 UT on 2016 February 27 with an upper limit of 20 mCrab for each. Dec (J2000): +78d 40' 45.0"
We have analysed 6.9 ks of XRT data for GRB 160227A (Siegel et al. GCN Circ. 19098), from 147 s to 31.1 ks after the BAT trigger. The data comprise 691 s in Windowed Timing (WT) mode (the first 3 s were taken while Swift was slewing) with the remainder in Photon Counting (PC) mode. The enhanced XRT position for this burst was given by Osborne et al. (GCN Circ. 19104). The late-time light curve (from T0+5.9 ks) can be modelled with a power-law decay with a decay index of alpha=0.41 (+0.11, -0.10). A spectrum formed from the WT mode data can be fitted with an absorbed power-law with a photon spectral index	of 1.79 (+/-0.03). The best-fitting absorption column is 7.3 (+0.9, -0.8) x 10^20 cm^-2, in excess of the Galactic value of 4.1 x 10^20 cm^-2 (Willingale et al. 2013). The PC mode spectrum has a photon index of 1.76 (+/-0.10) and a best-fitting absorption column of 6.6 (+2.8, -2.5) x 10^20 cm^-2. The counts to observed (unabsorbed) 0.3-10 keV flux conversion factor deduced from this spectrum is 3.8 x 10^-11 (4.2 x 10^-11) erg cm^-2 count^-1. If the light curve continues to decay with a power-law decay index of 0.41, the count rate at T+24 hours will be 0.15 count s^-1, corresponding to an observed (unabsorbed) 0.3-10 keV flux of 5.7 x 10^-12 (6.3 x 10^-12) erg cm^-2 s^-1. The results of the XRT-team automatic analysis are available at http://www.swift.ac.uk/xrt_products/00676423. Dec(J2000) = +78d 40' 19.9"
with an uncertainty of 2.8 arcmin, (radius, sys+stat, 90% containment). The partial coding was 50%. The mask-weighted light curve shows a multi-peaked structure that starts at ~ T0-100 s and ends at ~ T0+270 s. There are roughly four pulses with peaks at ~ T0-100 s, ~ T0-20 s, ~ T0+100 s, and ~ T0+200 s, respectively. T90 (15-350 keV) is 316.5 +- 75.4 sec (estimated error including systematics). The time-averaged spectrum from T-99.8 to T+236.2 sec is best fit by a power law with an exponential cutoff. This fit gives a photon index 0.75 +- 0.51, and Epeak of 65.8 +- 16.4 keV (chi squared 40.42 for 56 d.o.f.). For this model the total fluence in the 15-150 keV band is 3.1 +- 0.2 x 10^-6 erg/cm2 and the 1-sec peak flux measured from T+198.62 sec in the 15-150 keV band is 0.6 +- 0.1 ph/cm2/sec. A fit to a simple power law gives a photon index of 1.65 +- 0.10 (chi squared 51.62 for 57 d.o.f.). All the quoted errors are at the 90% confidence level. We observed the field of GRB 160227A (Siegel et al., GCN 19098) using the 2.56m Nordic Optical Telescope (NOT) equipped with the ALFOSC camera. Observations started at 20:19:12 UT on 2016-02-27 (i.e., 0.784 hr post-burst) and 2x120s R-band frames were obtained, followed by 2x1800s+1x1200s spectroscopy (i.e., at a median time of ~1.87 hr post-burst) covering 3200A - 9000A, all in a seeing of ~2.0 arcsec. The previously reported optical afterglow (e.g., Siegel et al., GCN 19098; Gorbovskoy et al., GCN 19099) is clearly detected in our stacked R-band image, with R~19.3 mag calibrated with nearby USNO B1 stars. Preliminary analysis of the spectrum shows a clear trough at the blue end of the spectral continuum, indicating Ly-alpha absorption from H I. We also detect several narrow absorption features, though at low signal-to-noise, which we interpret as due to, e.g., C II, Si II, O I, C II, Fe II, all consistent with a redshift of z = 2.38. We observed the field of GRB 160227A detected by Swift (trigger #676423; Siegel et al., GCN Circ. 19098) with the 12-inch AGU Robotic Optical Monitor for Astrophysical object - Narrow (AROMA-N) located at the Sagamihara campus of Aoyama Gakuin University. 10 images of 60 sec exposures and 5 images of 180 sec exposures were taken in the R filter starting from February 27 19:36:28 (UT) about 260 seconds after the trigger and stopped on February 27 20:02:05 (UT). Because the target was a low elevation (44.4 deg at the start time) and the telescope was slightly out of focus, the quality of the obtained images was not ideal. We do not detect the optical afterglow both in the individual images and the stacked image. The estimated five sigma upper limit of the combined image (total exposure of 1500 sec) is ~16.4 mag using the USNO-B1 catalog. Five telescopes of MASTER Net of robotic telescope participated in the observation of the GRB 160227A. Two telescopes detected prompt optical emission. We discovery very strong OT variations with time ~100 sec correlated with gamma ray flux (Sakamoto et al., 19106). With magnitude automatical magnitude ~ 17.3 We definetly see OT at a number of single and coadd images. OT was observed during ~ 1 hours. We see OT decay from 17.0 to 19.1 mag in the time interval from 115 to 2647 sec atger the trigger. The 5-sigma upper limit has been about 17.5 mag on first single image and up to 19.5 mag at on coadd images in later time. 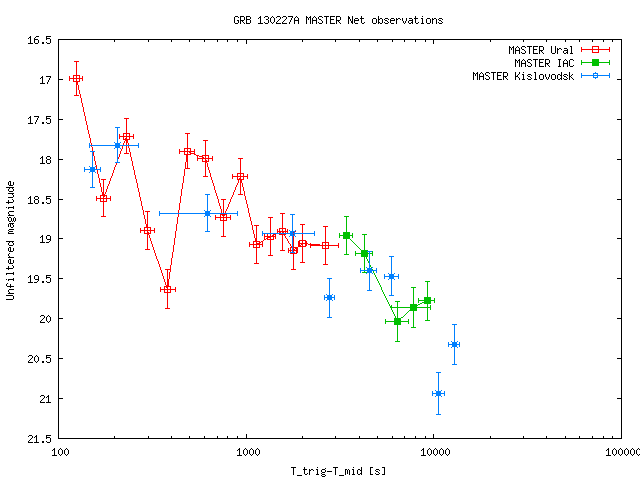 MASTER-Kislovodsk robotic telescope (MASTER-Net: http://observ.pereplet.ru) located in Kislovodsk was pointed to the GRB160227A (Siegel et al GCN 19098) 52 sec after notice time and 137 sec after trigger time at 2016-02-27 19:34:25 UT. On our first (30s exposure) set we marginaly see optical transient (Siegel et al GCN 19098, Gorbovskoy et al GCN 19099) within SWIFT error-box. OT also definetly seen at a number of coadd images. OT was observed for about 4 hours. We see OT decay from 18.1 to ~ 20.5 mag in the time interval from 152 to 12900 sec atger the trigger. The 5-sigma upper limit has been about 17.5 mag on first single image and up to 21.0 mag at on coadd images in later time. MASTER-IAC robotic telescope (MASTER-Net: http://observ.pereplet.ru) located in IAC was pointed to the GRB160227A 49 sec after notice time and 137 sec after trigger time at 2016-02-27 19:34:25 UT. On our first (30s exposure) set we haven`t found optical transient within SWIFT error-box. The observations started on evening sky (Sun altitude ~ -6 deg). Therefore, the first exposure upper limit is very low. We definetly see OT at a number of coadd images, starting ~ 1 hour after the trigger. OT was observed for about 2 hours. We see OT decay from 19.0 to 20.0 mag in the time interval from 3400 to 9200 sec atger the trigger. The 5-sigma upper limit has been about 14.5 mag (due to bright evening sky ) on first single image and up to 21.0 mag at on coadd images in later time. MASTER-Tunka robotic telescope (MASTER-Net: http://observ.pereplet.ru) located in Astrophysical Center Tunka was pointed to the GRB160227A 17 sec after notice time and 103 sec after trigger time at 2016-02-27 19:33:51 UT. On our first (20s exposure) set we haven`t found optical transient within SWIFT error-box. The observations made on not very well weather condition and was finished 10 after GRB, due to snow coming. The 5-sigma upper limit has been about 15.3 mag on first single image. MASTER II robotic telescope (MASTER-Net: http://observ.pereplet.ru) located in Blagoveschensk was pointed to the GRB160227A 8 sec after notice time and 93 sec after trigger time at 2016-02-27 19:33:41 UT. On our first (20s exposure) set we haven`t found optical transient within SWIFT error-box. The 5-sigma upper limit has been about 16.0 mag on first single image. The Swift/UVOT began settled observations of the field of GRB 160227A 161 s after the BAT trigger (Siegel et al., GCN Circ. 19098). A source consistent with the XRT position (Osborne et al. GCN Circ. 19104) is detected in the initial UVOT exposures but had faded away in later exposures. The magnitudes in the table are not corrected for the Galactic extinction due to the reddening of E(B-V) = 0.05 in the direction of the burst (Schlegel et al. 1998). We observed the field of GRB 160227A (Palmer et al. GCN19098) using the 0.8m telescope at the McDonald Observatory. The observation started at 2016-02-28 03:03:38 UT, or about 7.5 hours after the BAT alert. We identify the afterglow at the location of the UVOT detection, and our preliminary analysis shows the afterglow at R ~ 20.8 +- 0.15 mag in a stacked image of 21 x 3 min frames. The mid-point of the observation is 2016-02-28 03:47. The photometry is calibrated against a star at RA=194.74877 and Dec=78.68984 (J2000) with R=15.72, taken from APASS catalog. A second epoch data was taken at about 6 hours later, and the analysis of the data is ongoing. We observed the field of GRB 160227A (Siegel, et al., GCN 19098) with the 1m telescope of Mt. Lemmon Optical Astronomy Observatory (LOAO) in Arizona. The series of images are taken in R- & B-filter starting on Feb. 28 05:11:27 UT (~ 9.7 hr post burst).=20 The optical counterpart is clearly detected in a median combined image of R at the previously reported optical afterglow position (e.g., Siegel et al., GCN 19098; Gorbovskoy et al., GCN 19099; Mazaeva et al., GCN19102). We confirmed marginal detection of OT in a median combined B. The fields are calibrated to the near by star at RA=194.74877, Dec=78.68984 (R2=3D15.84, USNO-B1.0). The MAXI/GSC nova alert system triggered a bright uncatalogued X-ray transient source at UT 2016-05-09T09:04:16. There was no significant excess flux in the previous transit at UT 2016-0509T07:32 with an upper limit of 20 mCrab.